on September 15th and 16th. The Holy Icon began streaming myrrh in October of 2007. 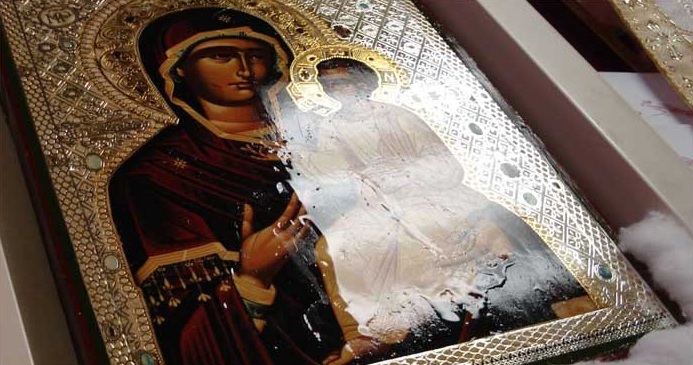 In June of 2008, the “Hawaiian” Myrrh-Streaming Iveron Icon was officially recognized by the Russian Orthodox Church Outside Russia as miraculous and worthy of veneration, and was given the blessing to travel with Her caretaker to the various churches and monasteries of Holy Orthodoxy. Since 2008, The Holy Icon has been to over 1000 churches in America, and has been venerated by more than a quarter of a million people throughout the United States. In many cities, the Icon is taken from one parish to another, being shared by all Orthodox clergy and Faithful. Numerous miracles have been attributed to the Theotokos through this “humble little Icon”, accounts are only just being collected, and are indeed numerous. Physical and spiritual healings have included the healing of blindness and eye disease, cancer, demonic possession, paralysis, kidney disease, chronic pain, and debilitating viruses. Yet, wherever the holy Icon goes, the Grace of Our Lord Jesus Christ and His Holy Mother abound. People have commented that just being in the presence of this Icon, you feel such an abundance of love and joy. It is truly indescribable. We are so very blessed that God has shown His love toward us by allowing us a small forebearance of what the saints call, "the true fragrance of sanctity." The true meaning of the Icon's appearance is known only to God, time will reveal all things. Yet, what we do know is that, God Loves us. Troparion to the Iveron Icon, Tone 1. And heal my body by thy grace, O most pure one. But grant us through thy prayers to bring forth spiritual fruit, and save our souls"
Kontakion to the Iveron Icon, Tone 8.
those in the Orthodox Russian lands who venerate thee. in order to understand the Hawaiian Icon's significance.